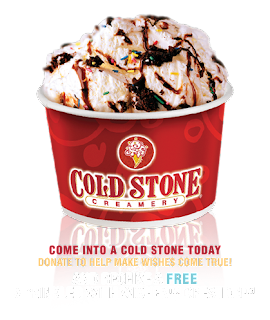 Cold Stone's annual Make-a-Wish fundraiser is coming up on September 27, 2011, from 5-8 p.m. For a donation, you'll get a scoop of Sprinkled with Wishes (sweet cream ice cream, brownie, rainbow sprinkles and fudge). It doesn't sound as bad as some previous years. Actually, it's almost identical to Jack's creation in 2009, except it has fudge instead of caramel. It's a little scary how I knew that.